Although totally worn out, I ran this bike for almost two years without really laying a spanner on it. I came by this machine after doing a small job for a fellow who lived down the road - Mac Clay's father, I believe he was. He had a Triumph twin that had not run for years and wanted it up and running so that he could get it back on the road. If I got the bike running, then he had an old side valve BSA that I could have. The only side valve BSA I'd ever heard of was the M20 and M21, so I jumped at the chance. I not only got his bike up and running, but I took it over to Hartills and got a shiny new MOT ticket for it too. 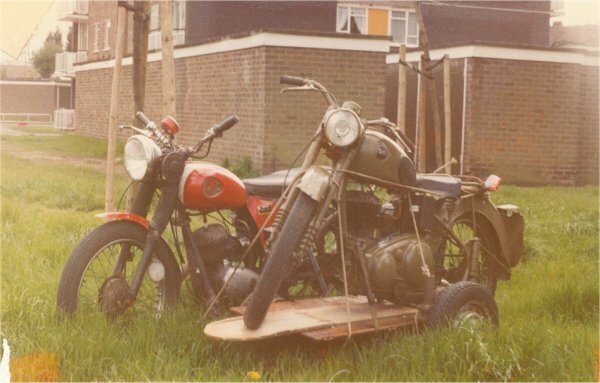 Imagine my surprise when instead of a dirty old worn out M21, a very clean, stored indoors, 250cc BSA C10L was wheeled out. It may have been painted up nicely but the bike was well and truly knackered. Already bored out to +060, and half of that piston was worn away, but despite this the bike would always start and only ever let me down once - and that was coming back from Ross on Wye, where I'd just spent my 21st birthday. Doing the maths would make that 1979. The C10L was given to a Cockney truck driver friend of mine, Wally, who in turn gave it to his son. Wally, I recently learned, died some time back - as for the C10L - I did a registration check and the registration number has been transferred to a car.